In an attempt to contribute to studies on global climatic change, 110 years of temperature data for Firenze, Italy, were analysed. Means and trends of annual and monthly temperatures (minimum, maximum and average) were analysed at three different time scales: short (20 years), medium (36–38 years) and long (55 years). Comparative changes in extreme events viz. frosts in the first and second parts of the 20th century were also analysed. At short time scales, climatic change was found in minimum and average temperatures but not in maximum temperatures. At all three time scales, the annual means of minimum, maximum and average temperatures were significantly warmer in the last part than in the early part of the 20th century. The monthly mean temperatures showed significant warming of winter months. Over the last four decades, minimum, maximum and average temperatures had warmed by 0.4, 0.43 and 0.4 ∘C per decade, respectively, and if this trend continues, they will be warmer by 4 ∘C by the end of the 21st century. The significant decline in days with subzero temperatures and frosts in the last half of the 20th century, further substantiated the occurrence of climate change at this site. 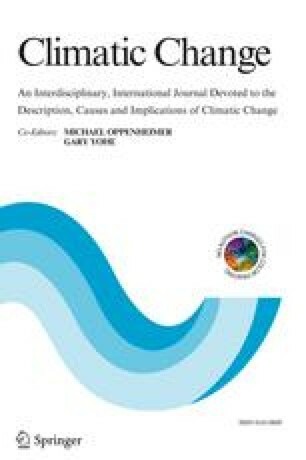 Jones, P. D., Parker, D. E., Osborn, T. J., and Briffa, K. R.: 1999, ‘Global and hemispheric temperature anomalies: Land and marine instrumental records’, in Boden, T. A., Kaiser, D. P., Sepanski, R. J. and Stoss, F. W (eds. ), Trends 93: A Compendium of Data on Global Change, Carbon Dioxide Analysis Centre, Oak Ridge National Laboratory, Oak Ridge, Tennessee (http://cdiac.esd.ornl.gov/trends/temp/jonescru/jones.html).